Are the days of tall ships really over? From prehistory until about 1865 ships were hand built, usually of wood, and sailed by brave folk. They plied the waters of the globe and were responsible for the discovery of (or contact with) foreign lands, a fact which we take for granted today. Trade agreements were reached between nations on the quarterdecks of grand "tall ships" of more than two masts, and wars were fought from their decks to protect or destroy those trade agreements. Fishing on a major scale was first done by sail, and passenger transport was by sail as it was for shipping food, building materials, precious metals and stone, commodities, and mail... all done with the power of the wind. Crews operated in relative harmony with each other and the elements out of necessity. By 1865, steam power was taking its toll on the sailing industry, and by 1920, the internal combustion engine had all but replaced the great sailing ships. 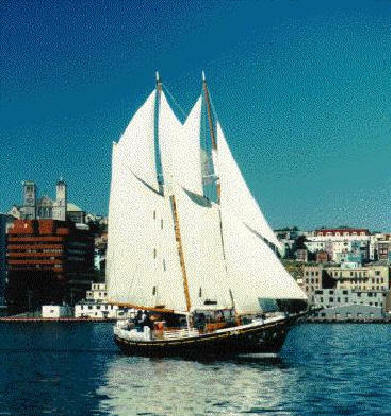 The last cargo delivered by sail was on 29 August 1957, aboard the three masted schooner Elian out of Wales. Her cargo was coal. There were very few transoceanic schooner cargo shipments between 1938 and 1957; twelve, to be exact. The last three schooners delivering cargo on the high seas were the Elian, Edna Hoyt (also a Welsh ship), and the Grace Bailey from the United States, and there were no sail-freight shipping firms after 1938, and all ships were privateers. Steam and internal combustion rang the death knell for the first golden age of sail. This low note in history, this loss of an unmatched, good, efficient form of transport, surpasses perhaps the momentous passing of the brief reign of the marvelous but more technological bicycle. When we consider the loss of sailing capacity, it has not received the attention that the electric rail trolley system's demise in the U.S. has received. The latter was caused by a criminal conspiracy between General Motors, Standard Oil of California, and other corporations, to buy up several dozen urban rail companies. The plan carried out was to rip out the tracks and install oil-burning buses. The several dozen U.S. cities that lost their rail systems never quite recovered. Similarly, the U.S. has lost a lot by giving up on sailing ships that relied on what was the renewable but non-limitless resource of tall trees. 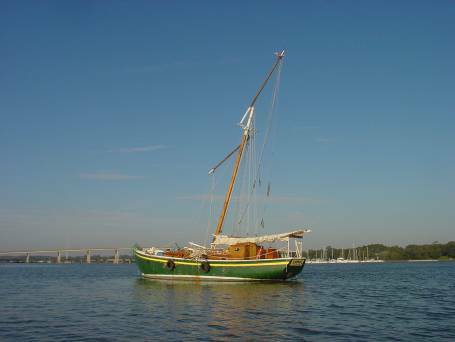 Schooner Elian is shown here in Cardiff, Wales, lading her last load of cargo. She was dismasted the next year and continued service as a motor freighter until the early 1960s. The second golden age of sail began in about 1940 with the advent of the great wooden racing yachts, mostly of a masthead sloop design, captained by their wealthy owners. They were a status symbol for the very rich until about 1960, when power boat manufacturers began building the first of the huge mega yachts for the very very rich, and the sailboat became available to the middle class. In the mid 1990s, even power boats were easily available for the middle class, and interest in sailing fell off with the American public. Civilization has extracted vast resources of tall trees, such that only 5% remain in many forests such as in the American Pacific Northwest. The Amazon rainforest is under assault from development and the climate going awry. The number of people who are still skilled in tall shipbuilding and sailing techniques are few and dwindling every day. Yet, all is not lost. There are numerous historical preservation programs and tall-ship museums, and the American Sail Training Association is turning out handfuls of enthusiasts every year with the skills necessary to run these great ships today. So information about construction and design techniques survive to the modern era and can be reemployed in shipbuilding tomorrow. Through the cultivation of reeds, hemp and other materials and conservation of trees, sustainable transport and trade will take us well into the new millennium as oil is running out. RENEWABLE ENERGY = SUSTAINABLE TRADE! Sail Transport Network is a movement. For thousands of years, wind energy moved people and goods all over the world without pollution. Today, dwindling, geopolitically sensitive oil is used for every form of transportation and commerce. Even e-commerce with computers is dependent on forms of petroleum, and trucks and cars clog roads to a deathly degree. The Sail Transport Network is dedicated to finding answers to the problems of tomorrow by looking back to the way it worked before. Trade, exchange, and travel are the basic triad of intercultural connection. If we can reduce the dependence on oil in these three areas, we will have reduced the majority of oil dependence in the world, while establishing through STN a model for sustainability in the new post-oil, greenhouse-ravaged world. There once was a time when you could walk down to the local harbor, and see nothing but great sailing ships. These ships stirred something in the soul of humans then, and it is that same stirring that can bring us into a cleaner, more sustainable future. The great age of sail didn't end, it just took a break. Now is the time to take up the sheets again, as it were, and sail into a future of sustainable trade that doesn't cause wars for non-renewable resources. The organization launching STN was founded in 1988 by Jan Lundberg, who sailed to Europe from California as a teenager on a 50' ketch with his family. The name of the organization was Fossil Fuels Policy Action, renamed Sustainable Energy Institute, and was the nonprofit group that became Culture Change in 2001. Culture Change (then SEI) launched the Sail Transport Network in 1999, after the organization had for almost one decade led the road-fighting movement it started. 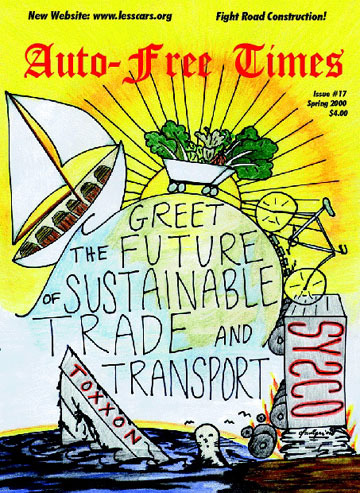 Other projects were Pedal Power Produce, the Auto-Free Times magazine, and The Depavers eco-rock band. But the main project from 1990 to 2001 was the Alliance for a Paving Moratorium. Our mission was, and still is, to reduce dependence on petroleum and to promote safer and more sustainable -- including non-motorized -- modes of transport. The intention was to stop urban sprawl and thus save farmland, wildlife habitat, and community cohesion. Public funds wasted on oil-intensive new road construction would thus be saved to go toward alternative transportation and repairing existing roads. STN complemented this movement as a globally replicable model for sustainable transport networks in all coastal areas and islands. The fiscal sponsor for Culture Change is Global Village Institute for Appropriate Technology, based at The Farm in Tennessee. GVI's sponsorship enables Culture Change and STN to receive tax-deductible donations (please make checks payable to GVI-Culture Change. When using PayPal for donations, please designate with an email if the funds are for STN or general support, and if you wish to receive a letter confirming tax deductibility.). 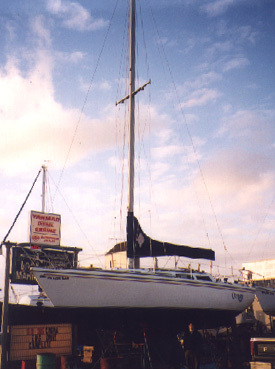 The Odyssey was the Sail Transport Network's first ship. In the Puget Sound it served as STN's floating ofice. Now under new ownership and renamed, she is still available for STN demonstration and education. Since the STN concept was initially developed in 1999-2000, much progress has been made recently in fleshing out the support structure. Read the Feb. 2007 report Sail transport community. Join us! For more information, see the contact information at the bottom of this webpage, and read the articles linked below. Please get involved by signing up for email alerts on STN or offering your availability to crew, or to serve as captain on your sailboat, or to donate a vessel for the expansion of STN!